Found mostly in 6-inch handgrip plates (as at left). 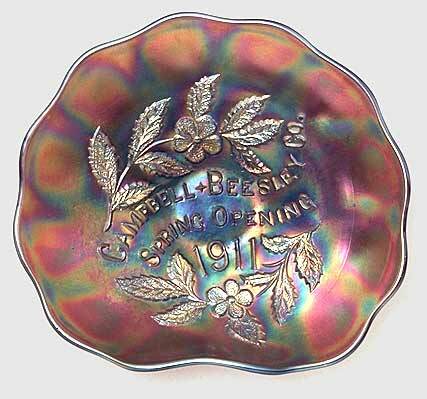 The lettering reads “Campbell + Beesley Co. Spring Opening 1911.” It's unusual to find any classic Carnival item with a date molded into it, so we know just when this one was made. 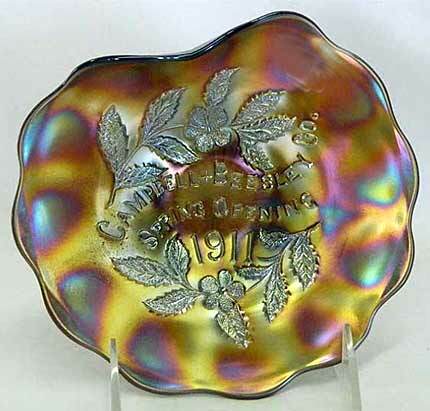 This handgrip plate with the sort of wonky shaping sold for $1,300 at the 2012 Heart of America Carnival Glass convention auction. Photo courtesy of Seeck Auctions.